Everything the Affinitas Accounting team does is designed to provide our clients with commercial insights that will help them drive their businesses towards greater control and improved profitability. For this reason, Commercial Insight sits at the heart of our business model as the outcome for each and every client. (Refer to Diagram A). Preparing financial accounts and tax returns plays its part in arriving at this ideal outcome – but it is so much more. accounting work. 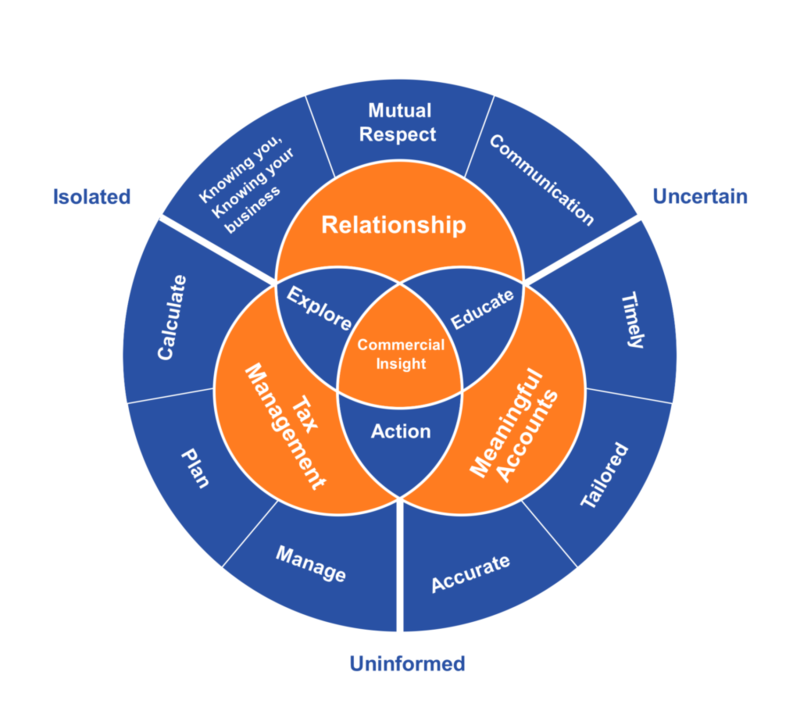 Most are Uncertain about the value of their current accounting relationship and direction in which their business is heading. Financials and returns are prepared and lodged and monies paid to the accountant and ATO, but they are Uninformed about what it all means to them and their business. In many cases, they feel Isolated or unconnected to the people who prepare their financials and unsure of whether this team actually understands them or their business. Relationship – the initial key to any professional service is establishing a personal relationship. Meaningful Accounts – there is not one universal set of accounts that we apply to every business. The items listed in your Profit & Loss and Balance Sheet should be tailored to allow you to see the line items that are important to your business. Data collection needs to be done in an efficient manner to ensure accuracy. Even very small businesses now can access accounting packages that minimise manual processing. This in turn assists in providing improved turnarounds and ensures accounts are prepared in a timely manner. Timeliness can be different for each client. Those needing finance may require accounts prepared soon after the end of the financial year, which other businesses may be happy to wait a little longer. But the general rule is that the sooner your business annuals can be prepared, the sooner you have a set of figures with which you can analyse the prior year and plan the year ahead. Tax Management – Once your business has the right systems and the right line items in place, you can use each quarter’s business activity statement to review the performance of your business. You can calculate your current tax/GST/wages tax liabilities and plan ahead for how they might be set aside and paid. We encourage every business to have a tax planning meeting with us each year prior to 30 June to estimate the year’s results, plan ahead for any tax issues and discuss any appropriate tax minimisation strategies that may be employed. Via the right Relationship, Meaningful Accounts and a Tax Management Plan, we can help Educate clients on the key numbers they need to track in their business, Explain the real or potential consequences of any changes and identify the Actions needed to counteract threats or capitalise on opportunities. The most important driver of every business will always be the people who own and run the enterprise. Our accounting model is designed to provide the Commercial Insight that will assist each business owner harness their energy, ideas and knowledge towards success.